One of the nice things about having a blog is being able to help out a fellow author now and then - always a pleasure, and I'm happy to help Miranda Brock reveal the (very pretty) cover of her new book. Which is now available for pre-order. Check out the information below - and you can keep up with the latest from Miranda by following her Twitter account here. Lily Calhoun wants nothing more than some excitement on her quiet, small-town life. When she gets caught in a storm one afternoon she gets more than she bargained for. Excitement suddenly falls into her life, literally. Stratus is mysterious, fun, and has a danger to him that Lily finds herself drawn to. Learning that he is either a demon or an angel only makes him more irresistible. But when strangers start turning up dead in her town, Lily begins to fear her new found flame may be the cause. 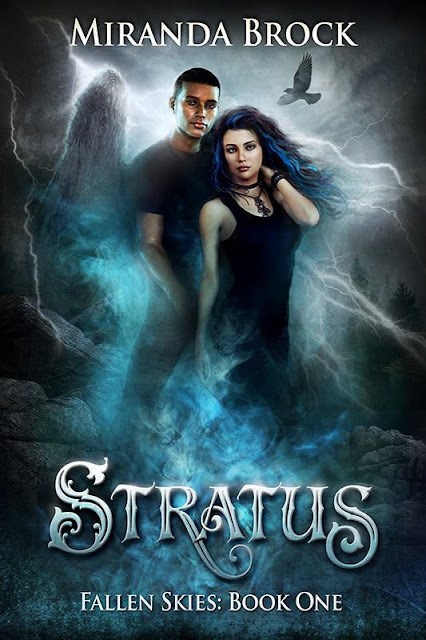 Caught in a tempest of lies, secrets, and betrayals, Lily must discover who Stratus really is behind his stormy eyes. Is it an angel who will win her heart, or will it be a demon who stakes his claim?